1.1 My First Trampoline 84"
Kids get more of a benefit when they use a trampoline regularly. Apart from fun, it also offers a lot of benefits in the form of health, helps with balance and also for educational purposes. 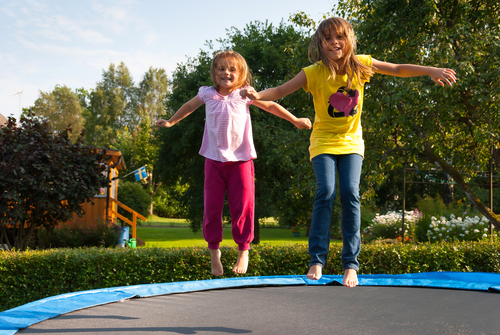 A trampoline for kids can help improve their motor skills. When jumping on a trampoline, it provides control over muscles and helps with coordination which improves the learning skills for your little one. It is also very useful for children who are not interested in participating sports activities because a trampoline provides little ones with physical fitness by moving their body without even realizing. It can also help tire out toddlers who have too much energy and help them sleep better. Some of these mini trampolines are foldable so they can easily be stowed away. This feature also allows them to be taken on the road to the grandparents house or anyone else you may visit. Most mini kids trampolines come with extra padding to provide extra safety.One important thing to consider before purchasing a mini trampoline is the weight limit. You must ensure the trampoline you buy can handle your child weight. Also make sure only one person jumps at a time to reduce the chance of injuries. The other good thing about kids trampolines are the prices. You can find a good one for around $50 and just about all of them are under $100. This makes them great Christmas and birthday gifts. Below are our reviews of the top toddler trampolines on the market! Boys and girls these days have endless options for playing as there are so many wonderful toys and games today in the market. But the fun that kids get by jumping on trampolines is unbeatable. This is the oldest and also most exciting way of spending leisure time for children. They are easy to assemble and carry and comes with all safety measures so that your child enjoys while being safe. 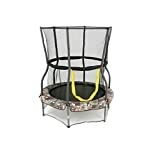 Below are reviews of mini trampolines for you to decide which is the best one for your little one. The My First Trampoline 84" is a well built and thoughtfully designed entry level trampoline that will fit both parents and kids and can be used in both indoors and outdoors. The design of the trampoline in the form of a safety enclosure makes sure that the parents have the visibility that is not restricted and they can come to the rescue of their toddler if any problems occur. With its durable surface and elastic bands which are flexible, it will give people some peace of mind and makes sure that the occupants are safe and in the end have a lot of fun. The affordable price tag means that one does not have to compromise on quality. The frame of the trampoline is made of galvanized steel tubes meaning that it is extremely durable and can be integrated into any surface that is blow molded and even into a tube leg structure also made of steel for immense support and stability. The mat used for jumping is made of UV resistant material which is durable and will provide reliable usage in both indoors and outdoors. The safety enclosure of the trampoline is made of steel tubes of a very large diameter and contains netting which is UV resistant to make sure the kids stay in the trampoline when in use. The trampoline also meets all ASTM standards or even exceeds it sometimes. The maximum user weight of the trampoline is up to 100 lbs. The protectors for the spring pads are also made of UV resistant materials to ensure long lasting reliability. High-quality materials ensure kids are safe. Sometimes wrong parts are delivered. Netting may not properly secure. The Skywalker Trampolines, 48-Inch is an attractively built mini trampoline that not only looks great but also fits everyone's needs with its design, reliability and even affordability with an excellent price tag to go for. This along with the inclusion of a lower enclosure means children can have all the fun while parents need not worry about incidents. The trampoline is made of a steel frame which is powder coated and includes padded enclosure uprights which means it is very much reliable and will last for a very long time. The included 360-degree handle will be able to provide enough support for young ones and first-time jumpers. There are stretchable bands included on the outside of the enclosure and is even covered with spring pads of a camouflage design for an extra layer of safety. The well included lower enclosure of the trampoline means that it keeps small items or kids from getting to the bottom of the jumping surface. The reinforced and zippered enclosure system keeps the entry door closed and removes severe gaps while using the trampoline. This trampoline passes and exceeds all standards put together by the ASTM (American Society for Testing and Materials). Easy zipper entry and well placed handles. Not a great warranty on replacement parts. There are those in the market looking for a quality kids trampoline but do not want to blow their budget as many trampolines claim to be good but they have glaring cons and they give up mid-way causing issues and nuisances. 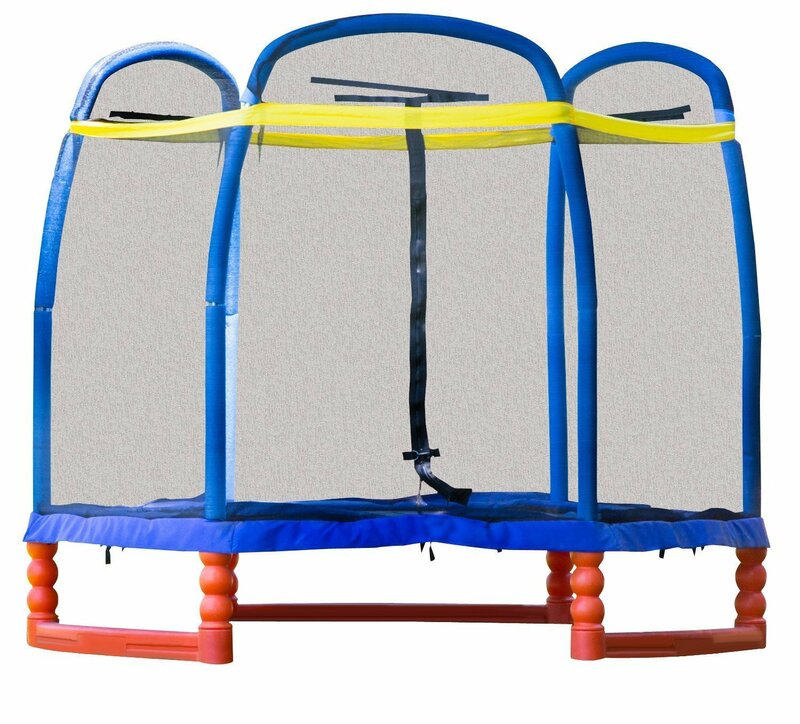 The SkyBound Super 7 Trampoline, 84" H, however, is very different in that aspect providing excellent quality and fun for a price tag that is very inexpensive and one anyone can afford. 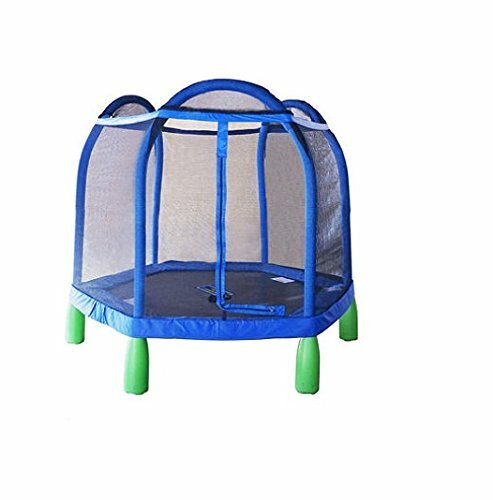 The trampoline features zinc plated springs which are of yellow color and high-quality netting which is of the mesh type. The trampoline is made of an octagonal steel frame which is galvanized and thus proves its durability. There is a spring tool provided in the box which helps in the easy assembly of the trampoline. The safety net enclosure also features a reinforced dual zipper meaning there are much fewer gaps when fitting them together. It has a 2-year limited parts warranty and even meets all standards set by ASTM for safety requirements. Easy to follow instructions and assembly. Wide design and galvanized frame mean that it is very much durable. The springs are covered and hidden well. Instructions can be unclear and difficult to follow. Inconsistencies in weight limit numbers. This is one of the popular options for because of its safety and superior-bounce. This comes in various bright colors and comes with an attachment that prevents any kind of injury or mishap. 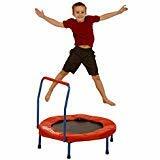 Leaping has never been easier with this sports equipment that comes under the popular category of mini kids trampoline. A complete safety net enclosure that is connected to four sturdy rods that are extended to make the base. These metal rods completely attach with the net using fixed hoop system that keeps it intact even when there is a lot of movement. It weighs 87 pounds and has the capacity to lift up to an impressive 150 pounds. The minimum age limit is 4 and the maximum depends on the weight. The only thing to keep in mind is that it is a youth trampoline and it may not be as effective for ages above 12 or 13. Superior design and innovative functionality that keeps it apart from the others in the market. As this is not a folding trampoline, it is robust and well-made for a more permanent location that ensures resilience and stability. Surrounding net allows viewing from the inside and the outside ensuring that fun and the outdoor effect are not compromised. Enclosure has no gaps and is fixed to the frame. Assembly process is complicated and time-consuming. Metal poles that encase the whole trampoline do not have padding. This trampoline is quite unique, compact, and is very easy to assemble. 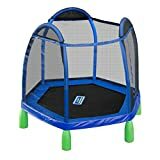 It is the best indoor trampoline for kids. It can be disassembled very easily and also it can be carried outdoors because this model is a compact one. This mini trampoline comes with safety measures which provide satisfaction for the parents as well. Let’s check out the features and benefits of this mini trampoline. This Fold & Go trampoline can be assembled from box to bounce not within less than 5 minutes. It’s very easy to assemble this for little ones. Assembling the trampoline can be done in such a way that, the legs can be screwed on, once screwed attach the handlebars of this mini tramp. 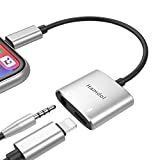 Now boys and girls can enjoy this device with utmost fun. In order to provide 100% safety, circular shaped safety pads are attached which provide extra comfort. This device is built with a diameter of 36 inch which provides utmost safety. It is approved by ASTM F963-08 Part 1, 2, and 3 and also approved by USA HR 4040 Federal Government Toy Safety Standard. The manufacturers are recommended to use this device of age from 36 months to 7 years. The benefit of using this mini trampoline is that children can improve their self-esteem in such a way that, they gain confidence by mastering the new skills present on the trampoline. This device works well with cardiovascular problems, as bouncing on this device improves the heart rate of the kids and give a great workout for heart. May tip over when using the handle bar. This video shows exactly how to setup this trampoline. Skybound 40” is a very innovative and imaginative design which is popular among the kids provided with all safety measures and utmost fun for all children. 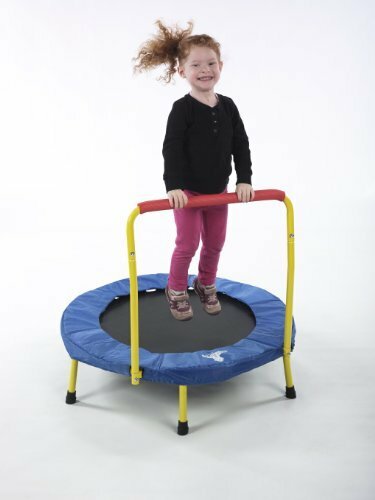 The maximum weight of this trampoline is 100 lbs and this device works perfectly for toddlers around 3 to 6 years of age. This indoor trampoline can be assembled very quickly with high quality of materials being used at the time of manufacturing it. The Handle Bar attached to this trampoline has a foam covered handle bar which provides safe play for children. The rubber feet used in this device provides a strong resistance against slippage while bouncing. This mini trampoline with bar is made up of thick PVC foam pad which can be extended inwards and ensures the stability for the users. Upon construction using steel frame parts, this thick PVC pads covering the frame offers protection for the kids while using it. The rubber structured capped feet provides strong resistance against water and also protect the indoor surfaces from being damaged. The vinyl pad cover used for this device yields safety for the little ones while bouncing and also provides stability. Children who are not interested taking part in sports activities, can get benefited by using this device as they did not realize that their body is moving up and down. This trampoline is designed with two colors to attract the kids. One is Blue Cloud and the other is Red. Handle bar made with foam pads to prevent injuries. Approved by U.S ASTM Trampoline Safety Requirements. Padding provided may be thicker that original which can cause issues. The Little Tikes 3ft is no doubt one of the best mini trampolines available. It comes with all the safety measures and soft fabric. Your little munchkin will be safe while jumping on the padded surface and it is one of the best ways to make your child do some exercise. The Little Tikes 3ft is lightweight and could be carried out easily in different rooms so that your child enjoys the ride under adult supervision. The surface is elastic and durable. Material on safety bar may come off easily. Safety bar is not adjustable. Trampoline is meant for indoor use only. This folding mini trampoline is excellent for the kids in the age group 3 and above. The design and safety springs used in the trampoline makes sure that your child enjoys to its fullest by jumping on them. Sturdy design that will last. May tip over when holding onto the bar. This is one of the best trampolines available in the market which has received a huge response from customers. It comes with many great features like adjustable safety bar and sturdy material in the bottom so that your child can have fun and exercise both at the same time. It also very safe to use for toddlers 3 years and above. Material used on the surface may tear after a few uses. Springs are not that strong. This miniature trampoline is a light and conveniently sized i.e. would not take up much space that can go in any corner of the house. This is one of the most effective ways to let kids have fun, keep them distracted, keep them active, and increase their motor skills at a younger age. Enhanced safety and security with padded and cushioned handle so ensure there will be no mishaps. This coupled with a sturdy safety bar that makes sure that remains sturdy even when the whole trampoline is moved. The bouncing system is certified. It has certifications including CE, ASTM, TUV, and GS. All this helps the verification of the level of safety. It has the capacity of withstanding weight up to 75 lbs. It has a minimum age usage of 3 and a maximum of 7 within the rage of the maximum weight. Falling mid jump is prevented using the handle which has extra padding as a safety precaution. It is still advised not to completely lean over the frame as it may topple over due to its size and the fact that it is lightweight and is a folding mini trampoline. Special cushioning on the safety bar & around the spring system. Extra gripping on the handle to provide balance and safety. Durable design & built to last. May be difficult to assemble. We all know trampolines have a great health benefits almost equal to running miles but by deducing the strain on the muscles. Almost all of the kids trampolines can be set up without a person having an expertise in the same but still its weary task and with the enthusiastic children around it no more than a headache. Lets see the tools required on hand for setting it up so you are ready beforehand. A powerdrill to makes those screws and nut and bolts a work of minutes, a spring pulling device to make working with springs a bit less hard and a rubber mallet just to ensure things are in place and of course gloves to protect the hands from pinching springs. Now, first thing you do is always follow the manual and before that you make sure whether or not you have received all the parts of a trampoline because even a single missing part will have disastrous effects on a trampoline’s life and working capacity too.Next making sure all the pieces are present and none missing, start setting up the frame which will take time but we have a power drill to work it in short span. Follow the manual while setting up the base frame as the probability of every manufacturer providing a different frame to its trampoline is way too high.Now work the springs and the jump pad it’s the most tough part and for sure it wears you out. But here's the catch if you are a science student you would know a way out of this. Never start doing the springs continuously one after other. You have to make sure the spring has a equal force on every part while you fix them.So just divide it in twelve equal parts then do the springs in area of 12, 3, 6 and 9 after that then area 1, 4, 7, 10 and so one and again you have a spring pulling device which will prove itself as an worthy assist in the whole process.Further are the spring protectors to ensure safety and provide protection from getting hurt from the springs, rubber mallet would be useful here and then the trampoline enclosure if provided which again is an easy task just some erecting poles and wrapping them up. Trampolines are one of the best sports activities which also provides a high level of safety for kids and youth alike. 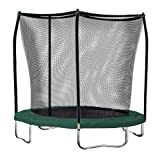 A trampoline provides physical, educational, and health-oriented fitness for boys and girls as it mainly concerns with the movement of the body in the upward and downward directions.This is one of the few sports that can be played indoor and outdoor with certain trampolines for both the cases. This does not mean that young children can be left unsupervised on it as it does have a few safety hazards. 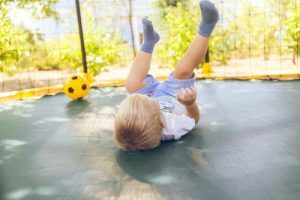 Even if the problems don’t relate to that of falling off the trampoline, it still is connected to neck, spine, and back fractures if not done properly. 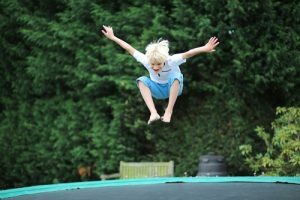 Many of the body parts of the younger kids are still in the growing stage so it is always safer to overlook the activity as a precautionary measure and avoid injuries.Check out some of the other top trampolines on the market here!